On the 28th of February, 4 startups were given the opportunity to pitch in front of a group of private investors at ‘How2Finance’. At the event mentors and business angels from the network of StartLife and OostNL, shared information and learned about startup investment. StartLife and OostNL offered the startups a training from pitch coach Frank Smallegange, to prepare themselves well. 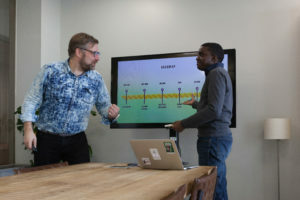 ‘Frank was able to rearrange my pitch without changing my own style’, says Sean Patrick Asiimwe, founder of Green Banana. His startup develops pasta made from green bananas and beans. Sean already had several trainings to improve his pitch, but Frank did surprise him in a positive way. ‘It’s always a challenge to be concise and at the same time provided your audience with the information that they’re specifically interested in. 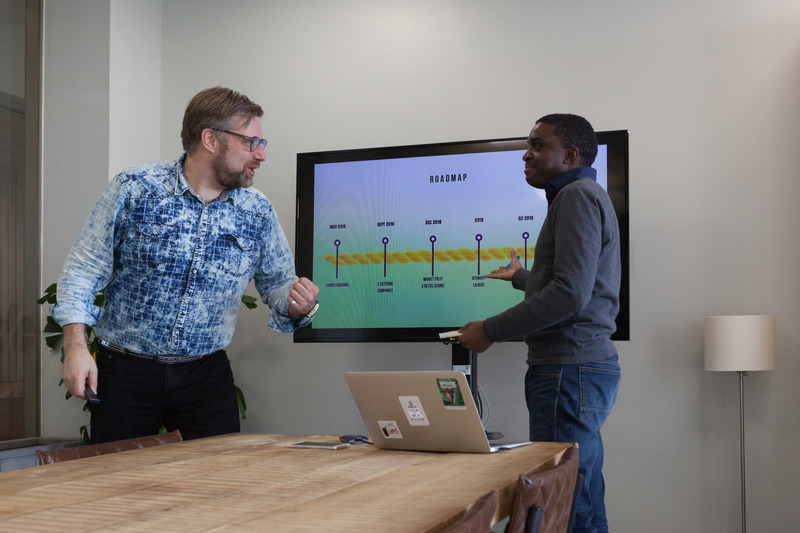 I learned that I could cut down a lot because raising some questions is a good thing.’ With the practical tips from Frank, Sean was able to enjoy his pitch even more: ‘The result of the training was a shorter story. Therefore, I didn’t have to worry so much about running out of time. Although we didn’t pay attention on things like posture or tone of voice, it improved automatically by feeling more comfortable’. Paul-Adrien Genet, co-founder of AgOS, also had a pitch training. His startup had developed a supply chain platform for agricultural businesses. Block chain is a quite technical topic but Frank had sufficient high-tech insight to give relevant feedback. Paul-Adrien had another training previously in which he learned about ‘storytelling’, but investors were a new type of audience for him. ‘With this training, I could select the right information for my investors-pitch. It was really a good experience’, says Paul-Adrien. StartLife choose Frank to arrange these trainings for his enthusiasm and expertise. He has been a pitch trainer for several years now, has a technological background in chemistry and IT and he coaches many startups based at tech accelerators, like HighTechXL, the accelerator in Eindhoven. Franks started coaching as a hobby, but it got a bit out of hand. So, he followed courses all over the world and ended up at Philips, TNO, DSM and tech startup accelerators, as a trainer. ‘Basically a good pitch doesn’t defer much from a pitch based on methods that can be found on internet. But a perfect pitch is always unique. A good pitch will automatically lead to the right Q&A, which is of major importance in a pitch’, says Frank. He always wants to see the passionate person that is pitching, not someone in ‘presentation mode’. According to Frank pitfalls in a pitch are: a) not taking enough time to explain the problem you are solving, b) talking to much about features of a product/service and c) not having a clear ask at the end of your pitch. For a good pitch you should make your audience feel the urgency of the problem you are solving and then show them that your company can solve this in a unique way. On Thursday the 28th of February Green Banana, AgOS, Vallei vis and Livestock Robotics pitched in front of investors that just had a refresher course at ‘How2Finance’. Sean Patrick applied the lessons he learned from the pitch training; he skipped large parts of his pitch and focussed on his key points. He was surprised about the result: ‘the audience didn’t realise I had skipped some slides. Actually, it resulted in good questions and thus in great interaction with the investors’.